Serve up a different dinner for 4 with this Old El Paso™ recipe for cabbage and beef hard tacos. 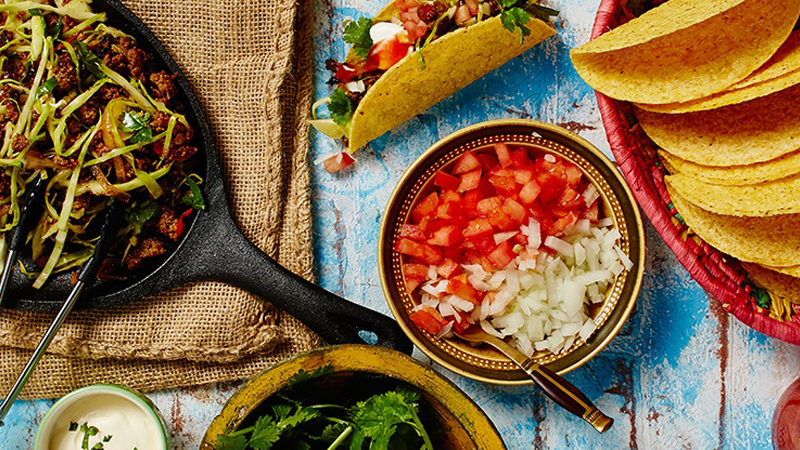 Use our Taco Shell Kit, beef and other fresh ingredients such as cabbage, red chili and coriander to put a saucy spin on a family classic. In a medium bowl, using your hands, massage the taco seasoning into the minced meat. Heat the oil in a large frying pan over medium- high heat. Add the onion and cook for 4-5 minutes or until starting to soften, add the garlic, red chilli and tomato cook stirring for a further 2 minutes. Add mince meat to frying pan, cook for 5 minutes, breaking up with a wooden spoon. Add cabbage and continue cooking for 5 minutes or until the cabbage has wilted. The mixture should be moist but not watery. Combine the fresh salsa ingredients in a small bowl and set aside. Serve warmed tacos with beef and cabbage mixture, fresh salsa, coriander and sour cream.